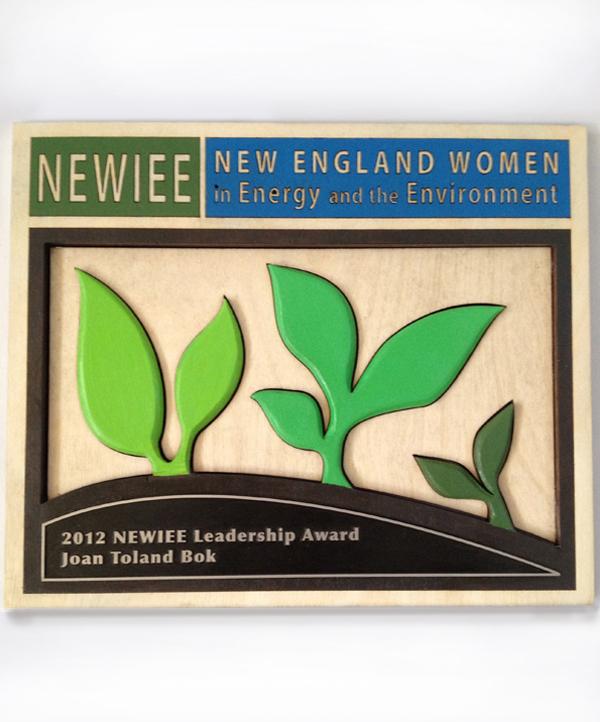 Cambridge, MA-based New England Women in Energy and the Environment (NEWIEE) is a member service organization that advances public interest in the energy and environment sectors and champions innovative female leaders. In celebration of its 1st NEWIEE Awards Gala in 2011, NEWIEE commissioned Ahlers Designs to custom design and create artwork for its awardees. As a business committed to local and sustainable production, Ahlers Designs was perfectly poised to design a unique work of art with an environmentally friendly focus. Gail Ahlers set to work on crafting wall sculptures featuring plants in organic shapes and energizing shades of green. Wrought from reclaimed lumber and painted with eco-friendly pigments, the piece promotes environmental stewardship and creative roots while prominently naming the awardee. NEWIEE was so impressed by this work that it has commissioned Ahlers Designs for stunning custom awards every year since.